Margaret and I went Downtown recently with our cameras just to walk, talk, and photograph whatever was interesting. We spent most of our time on Monument Circle, the heart of our city. We both photographed plenty of Downtown’s architecture, but I also photographed people on the busy Circle. I shot my tiny Canon PowerShot S95. 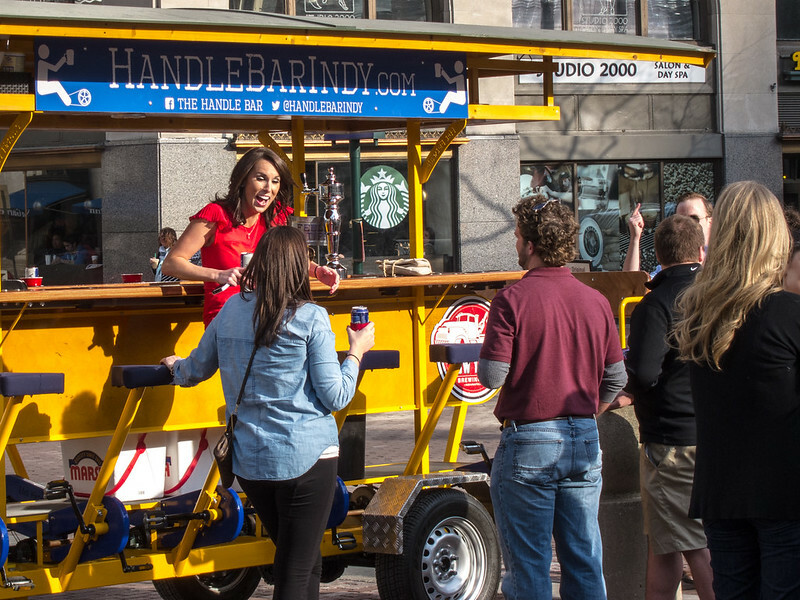 What a concept: a pedal-powered beer bar. Some of my co-workers did this once and said it was a blast. The animated red-shirted woman was a perfect balance of friendly and fun but in charge. I don’t drink beer anymore — I’m sensitive to gluten and beer just ties my guts up in a knot. It’s a shame, because this looks like fun. I shot this one from the hip. It’s the first time I’ve ever tried that. Naturally, the original is at a wonky angle. Photoshop let me straighten and crop this in just a minute. 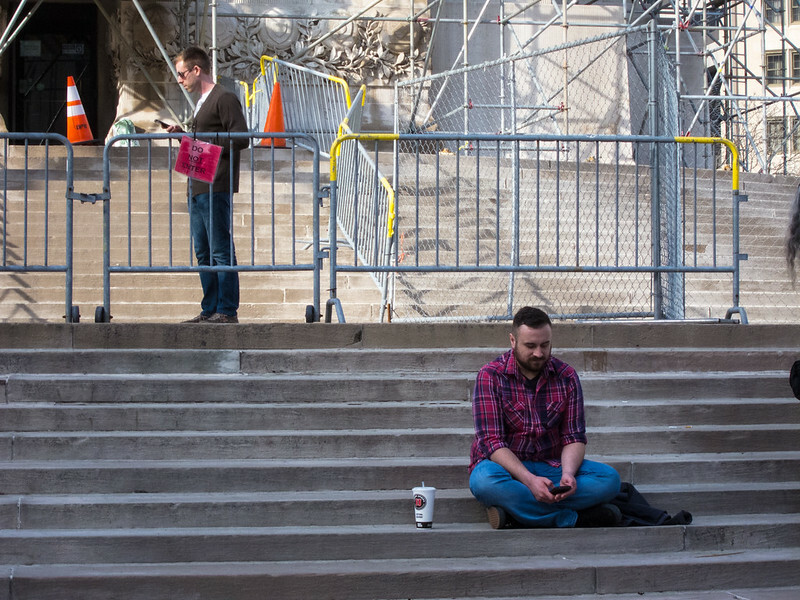 Lots of people came all the way Downtown just to keep their heads in their phones. Margaret interrupted the plaid-shirted fellow to ask if he’d take our photo together. He leapt right into action, mentioning he was a videographer. He handled Margaret’s DSLR like he was born holding one. I still have a lot of anxiety over being detected when I photograph strangers on the street. It sure looks like the person on the right noticed what I was up to. Cringe! For all of these shots, I stood way back and zoomed to the max. The S95 doesn’t zoom super deep — just 3.8x, equivalent to a 105mm lens on a 35mm camera. 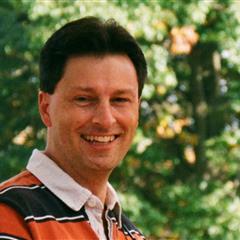 But given the camera’s 10-megapixel resolution, I can crop deeply to my subject and still have a usably large image. Could my S95 ultimately be a crutch? I hear of other street photographers shooting film rangefinder cameras with fixed lenses of around 50mm. Wow, how close they have to come! I admire their boldness. Nice stuff, Jim. 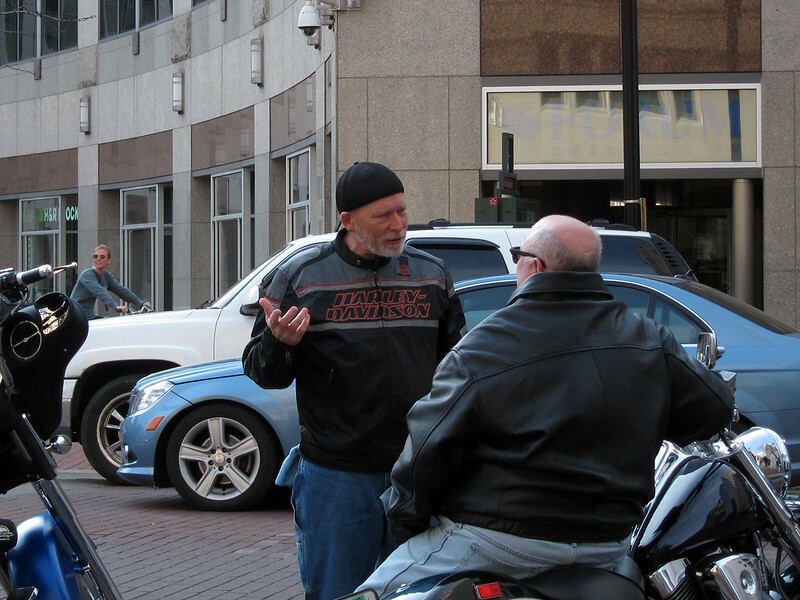 :) Those bikers make a good slice of life shot. I’ve read an increasing number of stories (still single digits) lately of places banning publishing street photography unless the people in the photos consent. Oy, what a mess that would be. I think in some ways a digital point and shoot is a great street camera if for no other reason than the screen to see what you’re doing without having to bring the camera to the eye, where it is more conspicuous! Funny enough, that is now the law in France, which you could argue was the birthplace of street photography! People watching: a time-honored and most interesting sport. A little nervous here, too, when taking shots of strangers on the street. But how else to record the ambience of street life? Yes. I don’t want anyone to feel watched. Nobody likes that. I’ve had my photo surreptitiously snapped on the street a time or two and I’m not sure I like it. Yet I do it to others sometimes. Your work is always entertaining and insightful (you shoot everything in sight, full frame). In the eyes of many, I’m also a number one pick. We’re in the same category in that regard, and I’m okay with that. Heh, I didn’t notice that fellow’s protruding finger until you pointed it out! Well done captures! But where is the picture of you and Margaret? I’m street photographer since about one or two years. My earlier pictures were strictly without any humans on, I didn’t like to capture them and I didn’t like the results.. Today I really love “Peoplewatching” and I’m taking photos with fixed 50mm lenses, which needs very little light or a small zoom with max 100mm (on a 35mm camera) and the inconspicuous camera system Fujifilm E-X2. Often I shot from the hip, but not always. In the moment I’m trying peoplewatching with 35mm cams, The old analog cameras are much less conspicuous and much smaller, only little people even realize them, and with a preset small aperture they have a much greater depth of field than a digital camera. For example the tiny Chinon Bellami has a snapshot setting, in which almost all photos are useable without setting a lot. The autofocus on the digital cameras interferes only with street photography, cause in most times it is to slow or wrong or it is to dark or there is less contrast and the manual mode is often to complicated. I’m looking forwards, to see some more of your street photographs! Maybe I’ll share the shot of Margaret and me in an upcoming post! I think you’re on to something important: when shooting street, you need a camera that doesn’t require much focus or exposure attention, because there frequently isn’t time. My first attempts at street photography in the late 90’s when I got my first Canon Rebel SLR (back when I didn’t know it was something other people did as well) were with an 80-200 lens, pretty cowardly, and often shooting them in the back or the side and/or from a long enough distance hopefully they wouldn’t notice or at least it wouldn’t be worth the time and energy for them to run up to me. One of my better tries was shooting from inside a college building, out the window toward a group of my fellow students who were walking towards the building. That Canon 80-200 wasn’t the best but it was very compact (for a full frame SLR zoom) when not fully zoomed out, and I’ve really been wanting the modern equivalent for my Olympus digital camera which is actually one of their cheaper lenses AND gets good reviews. But I also plan to try and get braver with the 50mm lens on my old Minolta X-700, and with my very compact and stealthy Olympus XA whose lens is 35mm, I reckon the XA should be perfect for shooting from the hip once I learn to get close enough. My X-700 also has a 70-200 zoom, but it’s pretty heavy and the push-pull action is awkward, but I should try it anyway at least once, and a 28mm which is the angle Garry Winogrand himself used. So that should provide a variety of learning opportunities when I can afford the film, and hopefully make me braver because I won’t be risking my expensive digital camera in case someone does get angry. Your 50mm and your X-700 will definitely force you to be bolder. I can’t imagine street photography at 28mm! Although not a small or inconspicuous camera, I find the TLR cameras work well for street. Perhaps it is because your face isn’t hidden behind the camera, or because some are fascinated by the relic you are carrying. I’ve thought about using my Yashica-D on a street trip someday for just that reason! 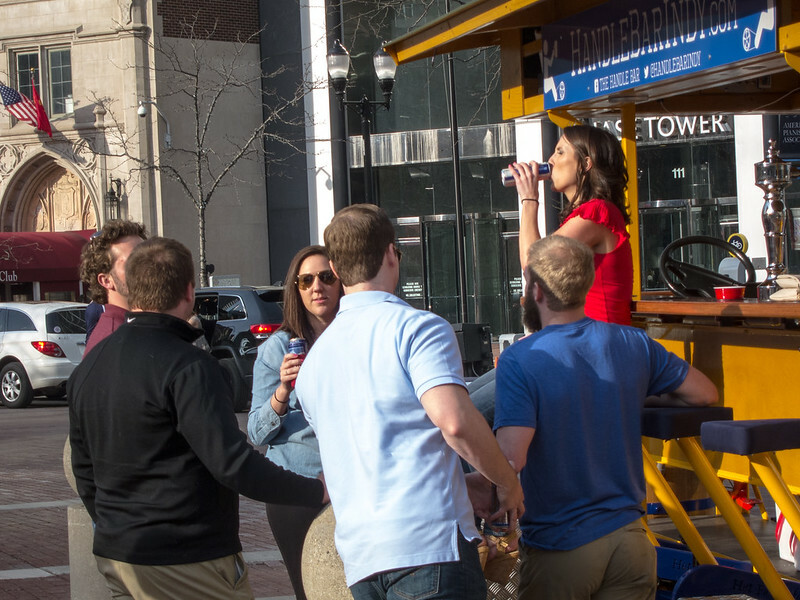 I saw one of these mobile bars in the gas lamp quarter of San Diego last week. No one was using it. The one you saw looks much more interesting. Something about the people milling about this one makes it look like a party! Good to find someone else from the San Diego area! I’m out east a little ways, right on the edge of Spring Valley and El Cajon. I have the same problem of not beeing able to put a rangefinder camera up to my eye and take streetlife-shots in the midst of strangers. A guess of mine: it’s a mixture of personality and practice. Drop in a 100iso film adjust f-stop and have fun, preferrably at a marketplace on a clear winterday with the sun blazing into peoples eyes. Mind it’s a half-frame camera; that gives 72 frames. Do b+w and self developement. I sent in a roll and they wanted to charge 22€ per picture. A killer! Thank you so much for your nice blog, especially your saturdays posts. I’m looking forward for tomorrow. Nick, I’m relieved by all the comments from people (like you) who express anxiety over street shooting. It makes me feel normal! I like the solution you found in terms of the gear you use. A fixed-focus camera like your Olympus sounds perfect. So glad you enjoy my blog! Yeah. People can be touchy about it. I would feel more comfortable with a telephoto as well, but the nifty 50 creates beautiful images. That’s true! You just have to get closer with a 50.